Contact for your comedy and entertainment needs. Tom Stewart is available to perform stand-up comedy at your club, lounge, bar, studio, restaurant, college, or other venue. The comedy material is topical and can be clean or edgy depending on your preferences and audience. Request Tom's comedy as a feature, opening act, or host. Tom is also available for comedy contests and festivals. Tom also books private shows for some of New England's top headliners. Tom Stewart's first love has always been entertainment. He has been in the broadcast field for more than 20 years. Tom has worked on radio stations in Providence, Boston, Cape Cod, and New London. Tom also spent 2008 - 2012 as the traffic reporter on The Sunrise Show and Evening News programs on Channel 10 WJAR-TV in Providence. Tom has worked as an on-air personality and producer on many different radio morning shows, in several different formats. He is always looking for new challenges in the broadcast field and is interested in learning more about any new endeavors on radio or television. 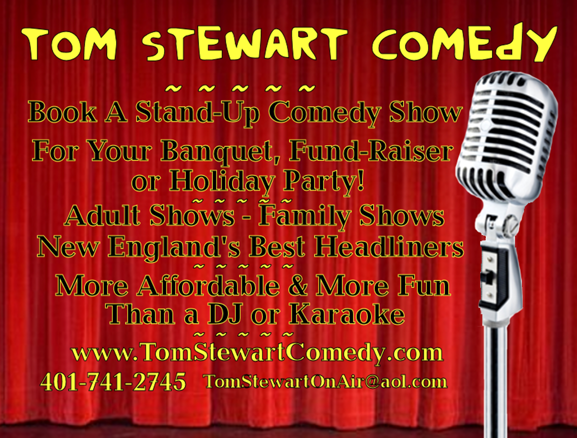 Tom Stewart is available to be the live host/MC at your party, meeting, banquet, ceremony, festival, expo, or comedy night. Live hosting duties can feature as much or as little comedic material desired by the client. Tom has over 18 years experience working as an MC and is comfortable in front of any size crowd or stage. He has hosted live events on stages like The Dunkin Donuts Center, The Providence Performing Arts Center, Mohegan Sun Casino Wolf's Den, Lupo's, and many others. Tom Stewart has been writing comedy most of his life. He writes jokes daily for his website and on social networks. He has also worked as a comedy writer for several different radio morning shows in Southern New England. Tom is also a freelance writer for Demand Studios, Helium, Text Broker, Livestrong, HowTo.com and other online publications. He is currently working on several different movie screenplays as well. Tom has written jokes for successful comedians, morning shows, and other entertainers. Tom can help you write jokes for your upcoming performance, presentation, stage show, radio show, TV show, etc. Tom has also written jokes for many of New England's top comedians. All jokes are the property of the comic, and are kept discreet. In other words, Tom writes it, but it's your joke, and no one knows anything! Tom Stewart has been a professional broadcaster for more than 20 years. He has a degree in Mass Communications and is professional trained in voice and articulation. During his broadcast career, Tom has recorded hundreds of commercials and promos for a variety of different businesses like Foxwoods, Mohegan Sun, Sound FX, and Rhode Island Lottery. He is available to be the voice person and/or spokesperson for your company or product.